Common mistakes in the ER… and how to avoid them! Should you give steroids with trauma? 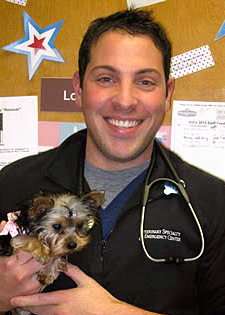 Outpatient parvovirus: Does it work? 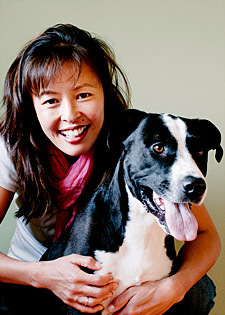 Trauma without the drama – what’s new in veterinary trauma? Head trauma – what’s new and how do we treat it? While Paradise Island is full of attractions, guests at the Atlantis Resort can find plenty to do without ever leaving the premises. The facilities at the Atlantis feature restaurants, shops, pools, beaches, a spa, a nightclub, and marine habitats, just to name a few. The resort presents a number of dining opportunities, from casual to elegant. The restaurants on the premises include Nobu, Mesa Grill (owned by Bobby Flay), Casa D’Angelo, the Bahamian Club, and Mama Loo’s. For the gourmet restaurants, a reservation and appropriate attire is required. Guests at Atlantis can experience marine life in a number of ways. Guests can interact with dolphins in an 11-acre habitat at Dolphin Cay or watch feeding times at many of the various marine habitats. 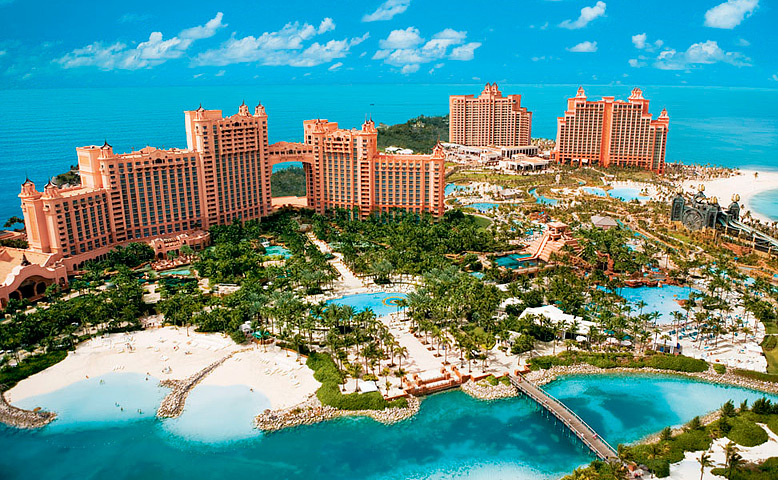 The Atlantis Resort provides a number of activities to fill guests’ days. Besides visiting the beautiful beaches, guests can choose from a number of pools. 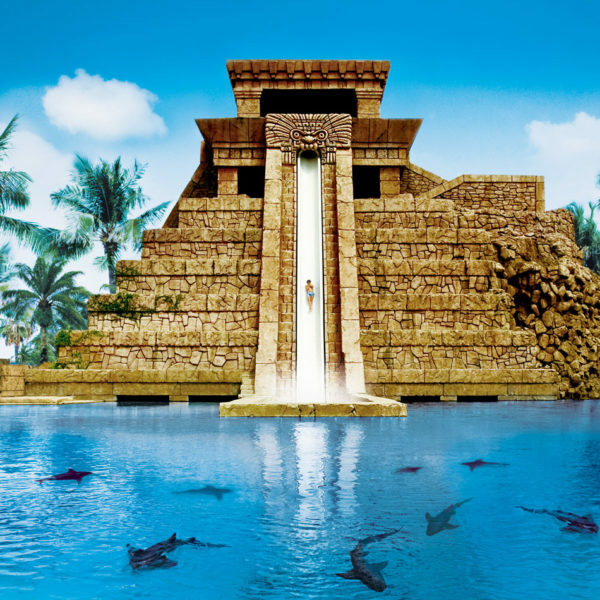 More adventurous guests can visit Aquaventure, a newly developed, 63-acre waterscape that houses waterslides ranging from the tame river-style ride to the terrifying Leap of Faith, which travels through a shark tank. While the resort’s tropical setting encourages water-based activities, there are many other recreational options as well. The Mandara Spa offers a number of treatments for guests at the Atlantis. There is also a movie theater that screens three shows a day, many of which are family friendly. Golfers should visit the famed Ocean Club Golf Course. The Marina at Atlantis is yet another attraction to seek out. The harbor accommodates luxury yachts, and its surrounding village offers a number of shopping and dining opportunities. The resort also has a number of venues to visit at night. There is a casino, a comedy club, and a Vegas-style nightclub on the property. The Coral Towers have just been completely remodeled. We are proud to unveil The New Coral, dedicated to multigenerational family fun. Unplug. Connect. Rediscover The Coral at Atlantis. 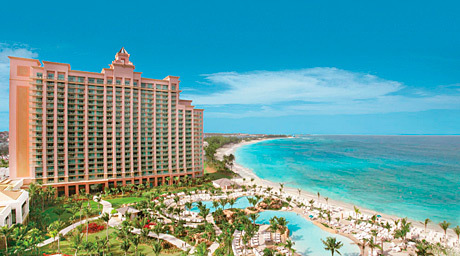 The iconic Royal Towers are the heartbeat of Atlantis and centrally located to all of the resorts premier attractions. Included in your stay is complimentary access to The Dig & Ruins Lagoon, Aquaventure Waterpark, 11 pools and the Royal Casino. Ensconced in stunningly original architecture and Bahamian décor, Royal Towers Guest Rooms are a study in vacation elegance and luxury. 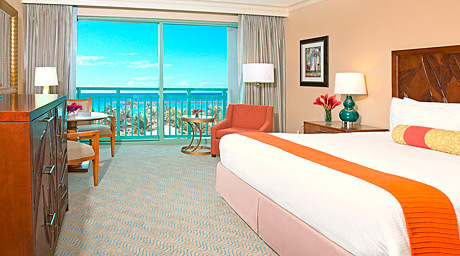 Each Royal Towers Guest Room is 400 sq. ft. and features either a king-size or two queen-size beds and variety of amenities such as French balconies with terrace, harbor or water views, sitting areas and full service-bars—plus easy access to the resort’s full service spa, a beautiful private white sand beach, gourmet restaurants, a sprawling waterscape of pools, waterslides, and the Caribbean’s largest casino. The Reef Atlantis offers luxurious, residential-style studios and suites providing vacationers with all the comforts of home. Measuring 523 sq. ft., The Reef features amazing ocean views, semi-private pool, and is just steps away from the white-sand beach and crystal-clear Caribbean. The Reef Studio is a spacious, beautifully appointed accommodation with deluxe amenities, kitchen and living areas as well as private balconies. 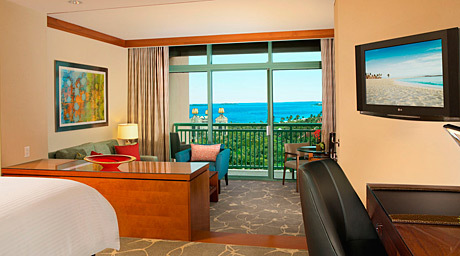 Resort guests can enjoy the gorgeous Bahamian views surrounding The Reef. At The Cove Atlantis, indulgence is a way of life. An oasis of style and sophistication within Atlantis—The Cove tempts guests with the cuisine of star chef Bobby Flay, the exclusive adults-only ultra-pool, and luxurious ocean-view suites. The Cove Atlantis sits atop two of the most beautiful beaches in the world providing an exclusive escape that’s removed from—but still provides easy, instant access to—the wonder that is Atlantis. Sophisticated and sensual. Private and exclusive. 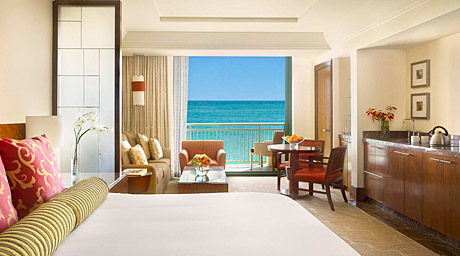 The Cove’s Ocean Suite offers Atlantis Paradise Resort Island guests a haven, a redefined beach vacation experience. Accentuated by luxurious amenities, all the resort services a traveler could ever want from Club Cove and capped by the pure blue of a never-ending Bahamian sky. Ocean Suites offer guests a refined level of comfort and feature a host of designer amenities—including full or French balconies with ocean views, open floor plans with step-down living areas, generous walk-in closets, spacious bathrooms with marble floors, twin granite vanities with vessel sinks, frosted glass-tile enclosed shower and a custom in-room bar. Cove Tower Suites: Call IVS for group rates & availability. **Run of House or Studio, or Suite means: You will get the best available room in that category at the time of check-in. European Plan (no meals), per room, per night, based on single/double occupancy. There is a $50 per night (plus resort charges) fee for each child or adult 12 years and older sharing the room. The Resort fee of $25.00 plus tax/per room per night has been has been discounted from $49.95!! • The VAT rate is subject to change depending on the rate applicable at the time the services are rendered.. There is a $6.60 gratuities fee per person (over 12 years) per night for housekeeping gratuity, pool/beach attendant/Lifeguard gratuity – Includes all persons 12 years and older. At the beach, Coral and Royal Towers. The resort fee is higher per person per night in the Reef and Cove Towers- for a studio. $6.00 per person – one time charge for Bellmen – Includes all persons 12 years and older. These rates available 3 days prior to and after the seminars. Two nights room and tax will be charged to your credit card to hold the reservation. WiFi in guest rooms and lobby for up to 4 devices per room, access to the fitness center for 2 people per day, 2 bottles of water per room per day, in room coffee and Tea, unlimited local phone calls, access to the Atlantis movie theater, casino lessons and shuttle service around the resort. Cancellations: Two night room and tax will be charged when you book your room. This charge is refundable if you cancel as least 30 days prior to your scheduled arrival. If you cancel within 30 days of your scheduled arrival date there is no refund of the 2 days charges plus taxes. You will be charged for your complete stay if you cancel within 14 days of your scheduled arrival or if you are a no-show or depart early. 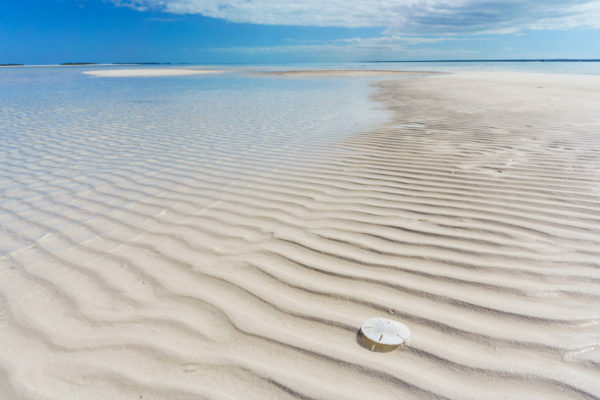 Just off the coast of Florida, there’s a place where the beaches are breathtaking, the vegetation is lush, and the weather is as warm and inviting as the people. Looking for attractions at the Atlantis Resort? December is the perfect time to visit one of the Bahama’s many spectacular tropical Islands because the weather is wonderful (averages 78F) and the rates are down! Paradise Island offers visitors the opportunity to experience the Bahamian culture through unique dining, shopping, and outdoor activities set to the backdrop of beautiful beaches and tropical weather. Dining on Paradise Island allows guests to experience new flavors and ingredients specific to Bahamian culture. Restaurants prepare local ingredients, such as grouper, snapper, and conch, using spices and techniques influenced by the area’s rich British, Spanish, and West Indian history. Diners can choose the elegance of the five-star restaurant Graycliff or the comfort of many smaller restaurants. The Bahamian culture is also evident in the shopping opportunities on Paradise Island. There are many shopping districts on the island, each offering distinct souvenirs. Marina Village houses boutiques offering resort wear. Festival Place is a wonderful place to find local crafts, including those made of conch. Straw hats and bags, woodcarvings, and other souvenirs can be found at the Straw Market. Those looking to buy luxury items, such as jewelry or perfume, should find their way to Bay Street. These items can all be purchased duty free. Shopping and dining in the Bahamas has an added convenience for those visiting from the United States. While the official currency is the Bahamian dollar, U.S. currency is accepted throughout Paradise Island. The Bahamian dollar and the U.S. dollar are equivalent in value. Most major credit cards and traveler’s checks are also accepted. Paradise Island is also home to beautiful early Colonial architecture. The history of British Colonial rule can be seen in many of the buildings. The Ministry of Tourism offers walking tours of the area that showcase some of the more historical sites. Nassau/Paradise Island – just a 2 1⁄2 hour flight from New York City and less than a 60 minute flight from Miami-Ft. Lauderdale – is served with daily non-stop service from many cities. After collecting your luggage and clearing immigration and customs you can proceed to a commercial taxi that will take you to the Atlantis Resort. Please remember to tell the taxi driver which tower you are staying in. Two night room and tax will be charged when you book your room. This charge is refundable if you cancel as least 30 days prior to your scheduled arrival. If you cancel within 30 days of your scheduled arrival date there is no refund of the 2 days charges plus taxes. You will be charged for your complete stay if you cancel within 14 days of your scheduled arrival or if you are a no-show or depart early.